Thank you to everyone who returned in 2018 for our annual reunion! Despite the morning showers and lack of marching rehearsal, reunions are always successful for renewing and creating friendships, sharing our stories, and growing our Spartan spirit. And, in this case, playing three Stevie Wonder tunes. A special thank you to Directors Kevin Sedatole, David Catron, and David Thornton. To view pictures, please see our page on Facebook. If you’ve never joined us – or it’s simply been a long time – please consider returning next year … it’ll be a big one! We’ll be celebrating the 150th anniversary of the MSU Bands, and the goal is to put 1000 musicians on the field at halftime. That’s 300 SMB members, and 700 alumni! The only requirement to join the Alumni Band is that you participated in an MSU ensemble at some point while you were a student. That includes concert band, symphony band, wind symphony, and many others. You do not have to be a former member of the SMB to participate. Come join us in 2019! 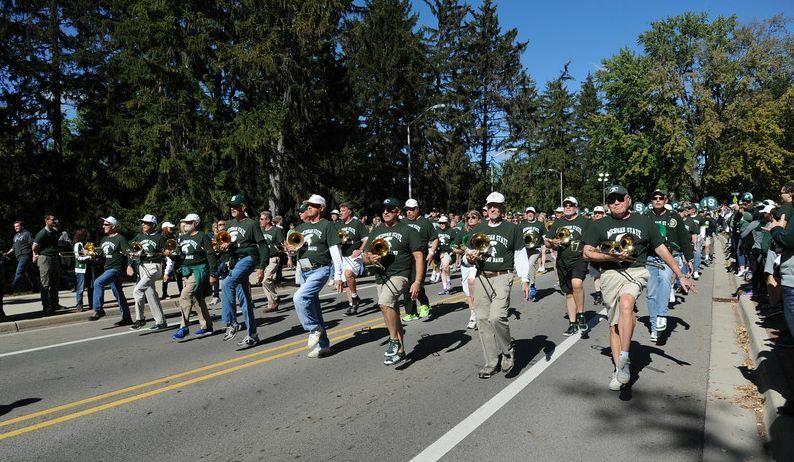 Celebrate 150 years of the MSU Bands. Date and details coming soon! Questions or comments? Please reach out to us at alumband@msu.edu, or at 517-351-4582.